Recorded, mixed & mastered at Riot City Studios, Morgantown, West Virginia from January - June 2017. Ryan Krofcheck - Vocals, guitar, accordion. Wes Hager - Guitar, synth guitar. Matt Marion - Vocals, congas, percussion. Tommy Bailey - Drums, synth drums. John Inghram - Vocals, bass, moog bass. 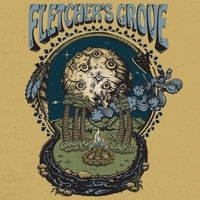 Fletcher’s Grove would like to thank all of our friends and family for supporting us over the last 10 years.